Hi all, very limited chances to image in South Australia lately due to the weather: arrived home last night & was greeted with a real deluge as over 2 inches of rain fell within a few hours...this is a virtual "cloudburst" down here! 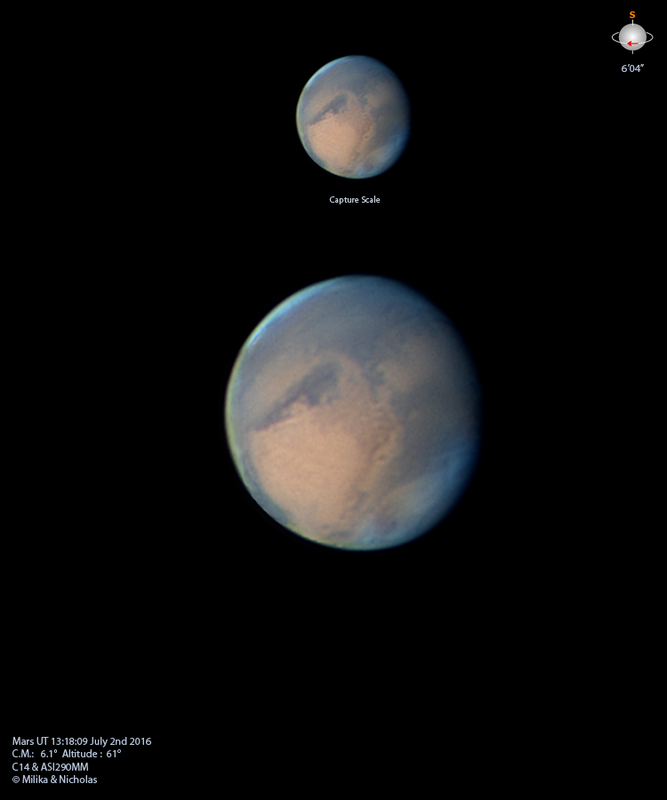 Finally for now the 2 Mars images...taken over 1.5 hours apart: reasonably pleased to at least get something after all the lousy weather..! Your "something" is way out of reach for me!! It is always a pleasure to see your work Darryl, excellent!! These are outstanding. Well done! Those are really good Mars captures Darryl! 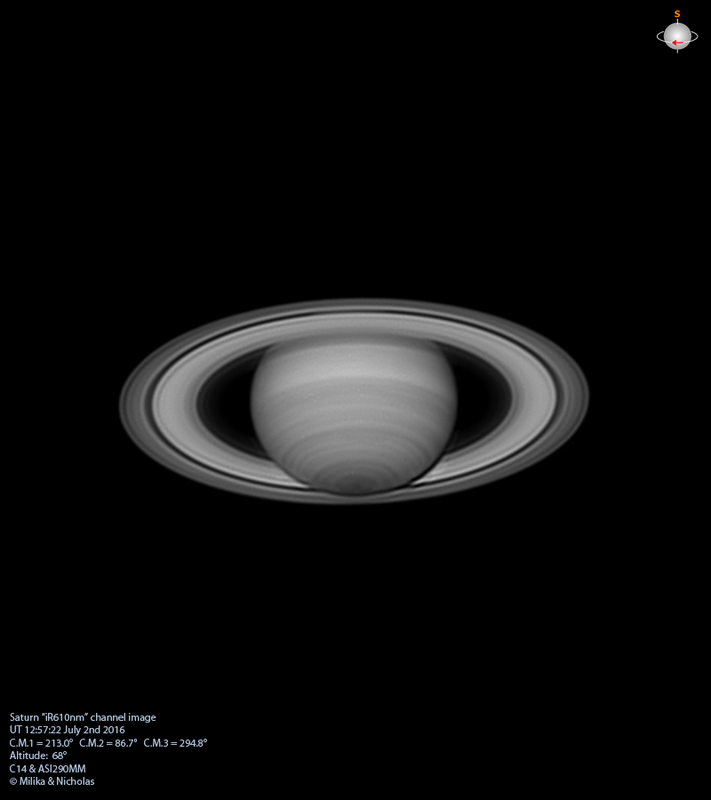 The Saturn iimage is outstanding! The fine banding with some undulations and spots showing is amazing. Cannot touch this at the planets elevation from this n hemisphere! Edited by DesertRat, 05 July 2016 - 10:28 PM. 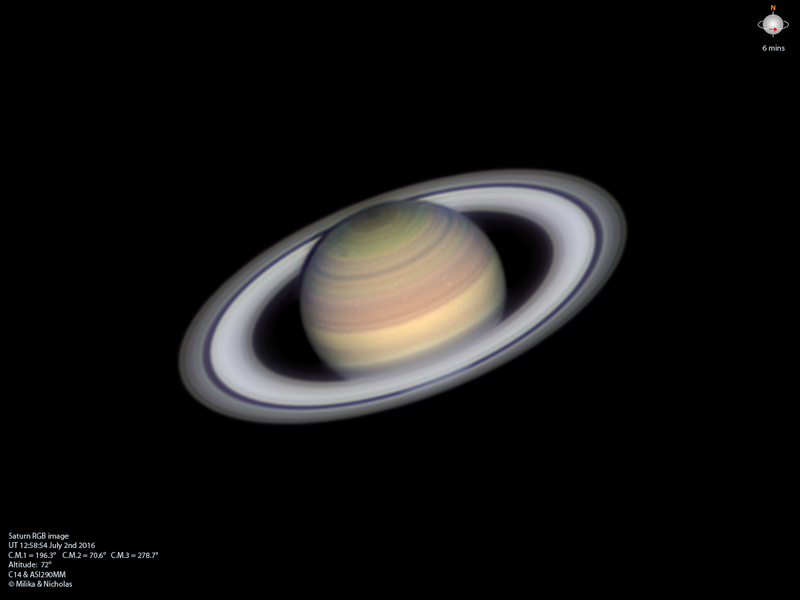 Amazing detail you capture in all three filters for Saturn Darryl! My red filter is always my best, your blue looks like my red. 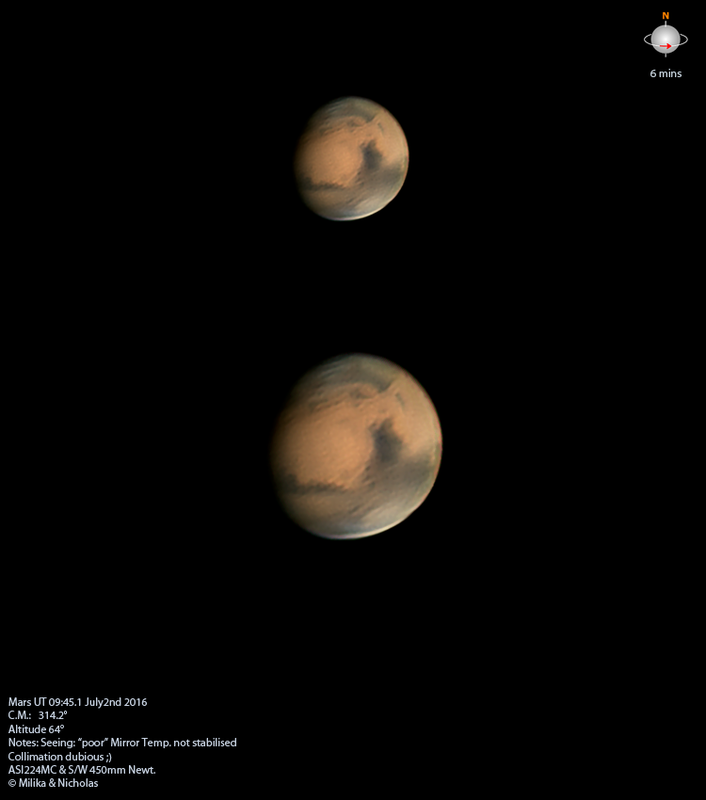 Excellent job on Mars as well! Thanks from Pat & me to dada, the A/Minsk fellas, Mert, Clay, Randy, Warren, Glenn & Frank - it's always nice to hear/read complimentary comments! To top that off on the 2nd night when we took these images I must have knocked the C14's finderscope completely off-kilter & I ended up on the ground under that scope with the camera removed to find Mars in the C14 via its naked illumination to get everything properly aligned - that completely stuffed my ageing body up..! We had intended to collimate on Spica but simply couldn't find it onscreen...eventually "discovering" a faint star which we collimated on pretty successfully in hindsight: I thought slewing to a brighter Mars would make finding it easy so we could align the finder & start imaging but it wasn't so - resorting to my "on my back" position...I'm too old for that sort of plurry caper, really!!! We got the scope at a very discounted price on the understanding it would go straight back if its optical qualities weren't up to our expectations - & had no intentions of keeping it on the alt/az drive for any more time than that needed to ascertain its optical merits...little did we realise that the motor firmware needed replacing & the time to get this from China etc was a p.i.t.a: unfortunately I can also report that AS!2's "experimental" field de-rotation function does not work but only seems to rotate everything excessively...Emil gave me no guarantees on that btw. Still a lot of work to do & I now realise just what a tiny scope the C14 is - seriously!!! Just the unit for our dotage probably...but while there's life one dreams...as long as all this is not actually an indicator of senility..! Your Saturn detail and colours are the stuff of dreams Darryl! I have no words to explain how good your pictures are. I was in Australia in February, but I dind´t bring my scope with me, and it´s a pitty. Where in Australia were the captures taken from? 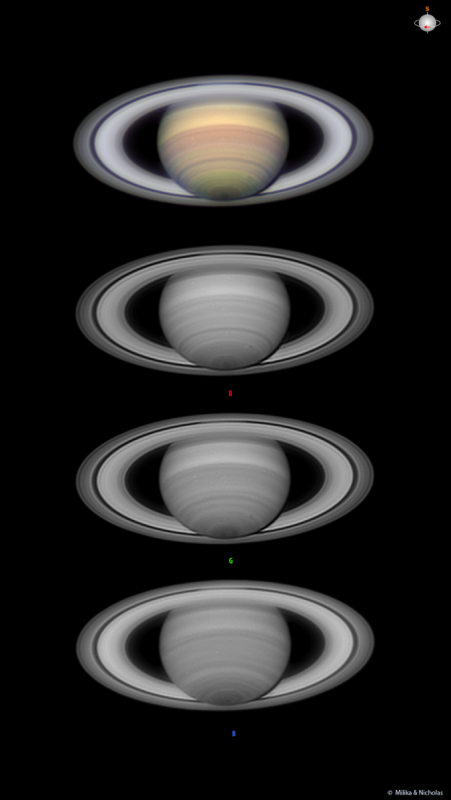 ...I have no shame when it comes to planetary imaging btw! This'll probably send me back to the "Newbies School" but despite all the factors against us when trialling the Skywatcher 450mm Newt we drew quite a bit of confidence from the tests at Carrieton where we used the C14 for the images at the start of this thread - I won't call it a "dob" even if it was acting like one ...& within a few days it will be swinging on the EQ8. The seeing was a lot poorer than for the C14's captures 2 hours later & I had not attempted any mirror cooling/equalisation...the temperatures literally drops like a stone at that time of the night up in those areas & we already had the C14 on ice (again, literally) waiting for it to get down to equilibrium whilst we mucked around with the S/W...smashing my power box & stuffing up my back completely during this time. Quite a lot was of course the seeing, but also the alt/az drive's penchant to "lose" the planet onscreen: I did a star alignment which does help the tracking but with something new & (obviously) unfamiliar tracking peccadilloes I spent a lot of time at the finder getting the planet back onto the sensor - hence my stuffed neck, shoulders, legs et al!!! The really big issue that night was the field rotation...a 6 minute capture was pushing things rather hard I realise (who, me?!? ) & unfortunately AS!2 didn't derotate the frames - it actually rotated them further!!! The answer was to chop the avi up into (roughly) 40 second segments, process each separately & then bung them into WinJupos - this solved the field rotation which is a good thing to know...even if I won't have this issue the next time we go out. Anyway, regardless of the outcome I think we're onto something once we sort out those things we know we can improve significantly...such that the image-outcomes "should" improve from the image below markedly. ...oops - thanks also Roberto & Petrus - appreciated fellas! 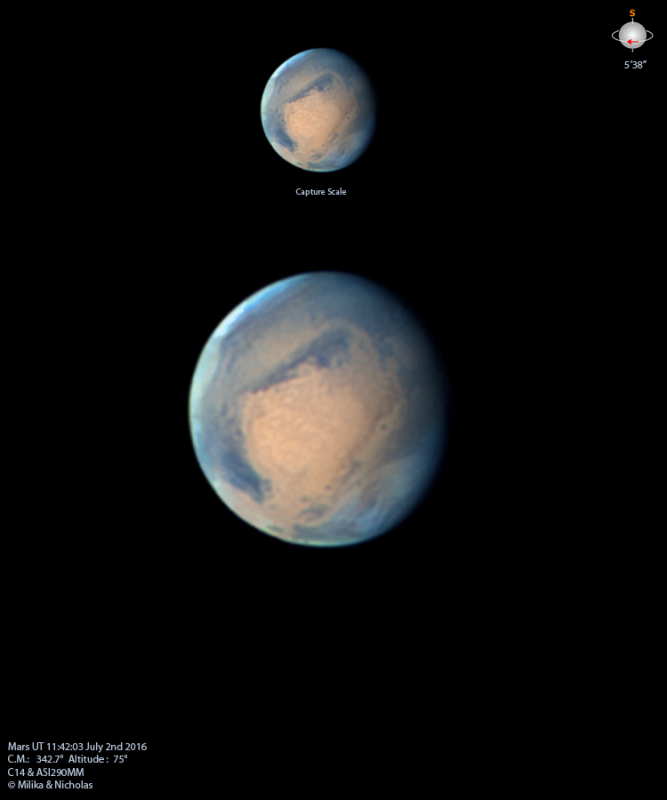 I'd quickly processed the 18" Newt images this afternoon - if you can "quickly" segment an avi into 10 sections, process each, measure & recompile in WinJupos etc..! I'm sure I can do better & the post-processing after WJ was very slap-dash tbh...we ran off 4 avi's using the 18" & I chose this first capture merely because the planet was onscreen for the entire duration...it went AWOL several times during the other captures & it was easiest segmenting this avi to see whether WJ would handle the field rotation. Also, I added 20 seconds to the last timestamp for WJ because I'd simply calculated the timestamps by dividing the segments, presuming them as 36" captures & started from the capture start-time...FireCapture supplies an "average" FPS & this means the actual midpoint UT's of each successive segment "drifts" across as it advances over the full avi's entirety, causing the errors. Other aspects like reducing the secondary mirror size (the stock one is pretty large tbh!) should assist...I'm making a very lightweight upper & lower OTA tube from 0.8mm polypropylene to replace the awkward supplied material shroud...making mirror defogging a bit easier & by extending it further at the top hopefully slowing down secondary fogging a bit more...also replacing the steel 2-piece truss tubes with single-piece ally units. On the truss tube aspect I'm quite impressed with how it seems to hold static collimation & whilst it might seem funny this scope is very easy to set up...our most difficult element is the EQ8 but I have an all-ally pier that I will convert the top of to accommodate the EQ8 head...this ally-pier has removable legs/stays & will be much lighter than the steel EQ8 stock pier...I just need to work out a good compromise height for it for both the C14 & 18" Newt - it is far too tall atm. Mate, they are stunning results! A 450mm (17.7 inch) Newt? IMO, this is a only a tiny step up from a C14. Seriously, you need to go to at least 20 inch to even gain an extra stop (double) of light. Come on Darryl, you're a Big Boy...take a Big Step! e.g. Have you considered a 106cm (~42") SCT? Darryl, I won't tell you that your C14 images are rather good... because you likely have enough trouble passing through door frames with your head all swollen from all the recent compliments that you received. Edited by RickV, 07 July 2016 - 03:56 PM. I'm closing in on 67 now but still managing to hobble about - hope you're still going strong - it sounds like you are! Rick, we widened the doors years ago...but your newbie status will allow me to overlook your ignorance of our prowess! Actually 18" - regardless of your maths...& me leaving off the few extra mm's above...but speaking of "status" this "gaining an extra stop" stuff is only reinforcing your newbie credentials brother! 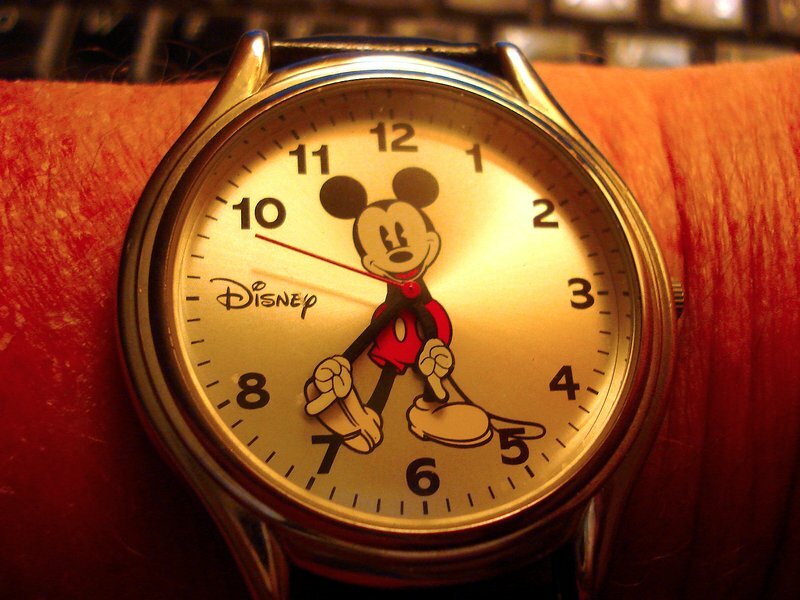 RE: "newbie status", "status", "newbie credentials"
Well Darryl, did you get a "status watch" when you bought your C14? No, eh? When I bought my "professional" C11 it came with the a commemorative time piece! Fantastic images Darryl, as always!